Shortly after the Japanese attack on Pearl Harbour, and its resulting status of an Axis nation, China approached Canada with the hopes of obtaining critically needed war materiel. This included field guns, trucks and Bren light machine guns. With Canada’s agreement to supply these, a Chinese delegation travelled to Canada. During their visit of the John Inglis plant at Toronto, they asked if Canada could also supply semi-automatic pistols, specifically the Model 1935 Grande Puissance manufactured by Fabrique Nationale, of Herstal, Belgium. 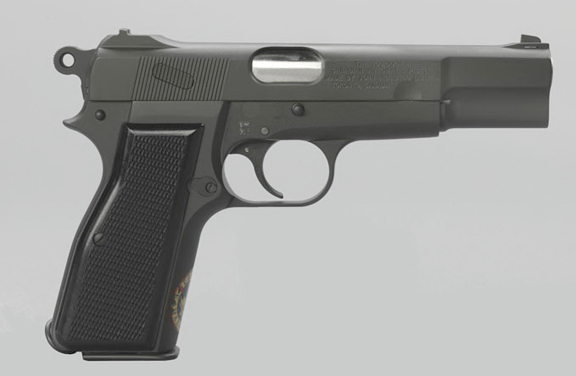 Over a period of several months Inglis reverse-engineered the pistol and started manufacture of the pistol. The terms of the agreement included that the each pistol was to include a spare magazine as well as either a cloth holster or a wood combination holster and shoulder stock. 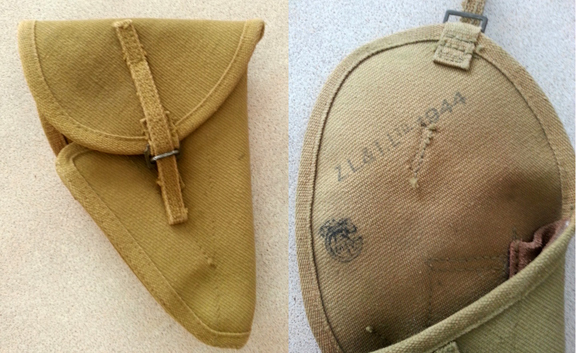 Inglis sub-contracted the manufacture of the holsters to Zephyr Loom & Textile (ZL&T), an established, Toronto-based, manufacturer of Pattern 1937 Web Equipment for the Canadian Army. 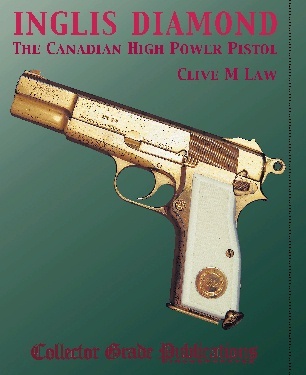 After a first shipment of 4,000 pistols was made the contract was cancelled by the Canadian government due to the inability to deliver the pistols to the Chinese Army. The remaining stock was then accepted by both the Canadian and British Armies – this included the holsters. 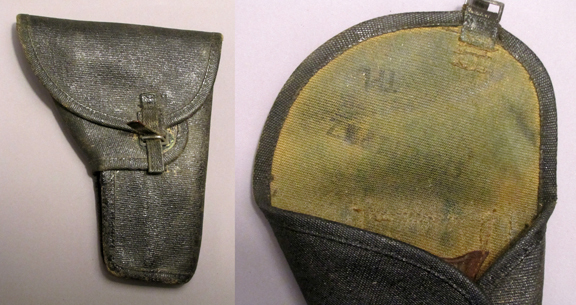 The holster, made of webbing material featured a single fold-over flap opened with a quick-release tab. This holster was officially termed “Holster, C, No. 2, Mk 1”. Almost immediately complaints were raised about the extremely tight fit of the pistol in the supplied holster. Inglis denied any responsibility, stating that the holster was constructed to Chinese specifications. Faced with the situation the Canadian Department of Munitions and Supply set about redesigning the holster to better suit the Canadian Army’s needs. The result was a double fold-over design that offered ample protection to the pistol and provided for quick and easy withdrawal of the pistol. Both models made provision for a spare magazine. The quick-release tab was also improved. 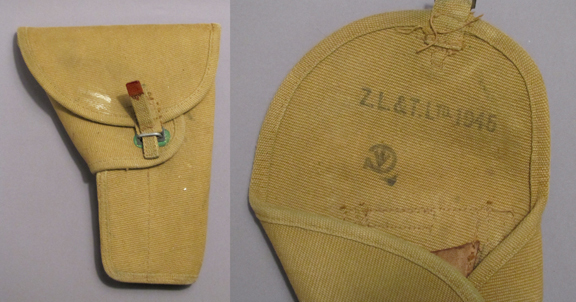 As with the early model, this model was also manufactured by ZL&T. This model was officially known as the “Holster, C, No. 2, Mk 2”. Standard issue second pattern holster. Clearly visible are the date and manufacturer’s stamps. In addition to the obvious physical differences it is worth noting that the early models are all dated 1944 while the second model is dated 1945. In addition, some models will be found in the natural tan colour of unfinished web material while others may be found in a green finish, the result of dying the cotton prior to looming. However, there exist two rare models that bridged these two production models. 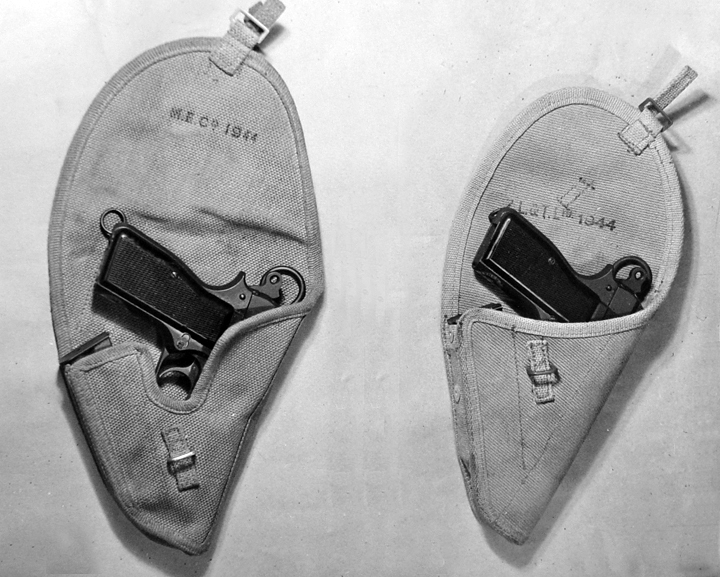 One was a minor improvement by Canada which saw the early type quick-release tab replaced with the improved type – but still utilizing the early holster body. 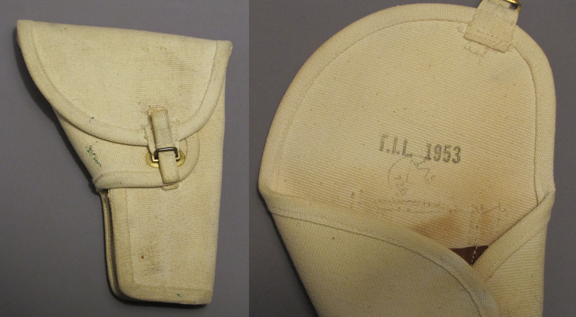 In addition to the quick release tab this holster can be identified by the use of a single rivet attaching the spare magazine sleeve to the holster body (in lieu of the two rivets used on the first pattern) and the 1945 date stamped on the inside of the flap. Little is known of the other experimental model, developed by the British, and it is possible that only a single example was produced. This style retains the general shape of the first pattern holster but features a deep cutout to allow the user to gain a better grip on the pistol and thereby facilitate its removal from the holster. The single known model was manufactured by the Mills Equipment Company, of London, England, and is dated 1944. No surviving examples are known and only a single photograph, located in DND files, testifies to its existence. 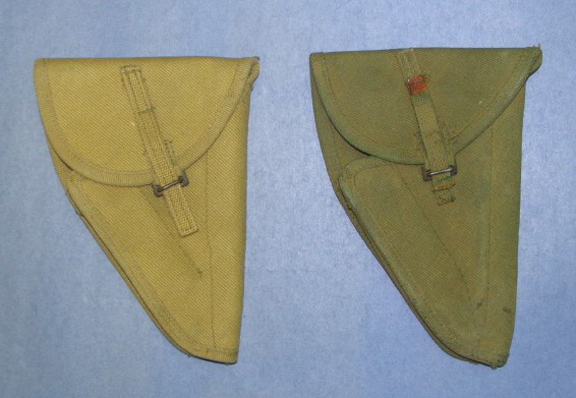 The second pattern holster remained in use through the Korean War until its ultimate replacement by a holster designed for use on the Canadian Pattern 1951 Web Equipment. Nonetheless, as the new webbing was not a universal issue for many years the second pattern holster can be found with manufacture dates into the 1950s. Examples can be found Blanco’ed white, for use by Canadian Provost Corps, as well as painted black for wear by members of the Royal Canadian Armoured Corps. The same style can also be found in black leather (with a number of variations of hangers) as well as in a white ‘parade’ version, made of lightweight plastic. Left, An Officer of the Royal Winnipeg Rifles wearing a blackened second pattern holster in keeping with Rifles’ tradition, ca. 1945. 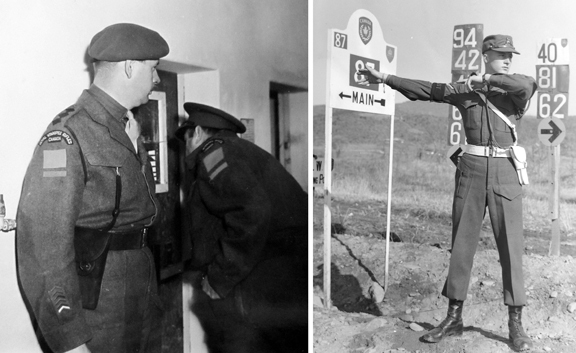 Right, an immaculately turned out ‘Provost’ directing traffic in South Korea, 1952. 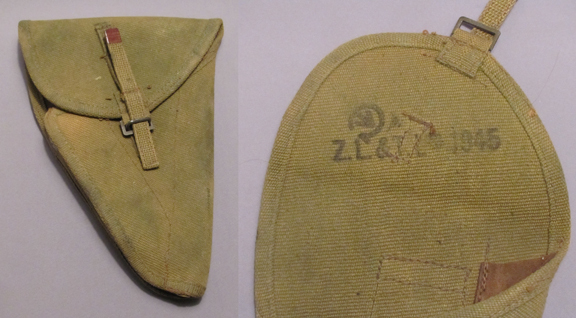 In addition to variations in colour and manufacturer’s marks, some holsters (almost exclusively second pattern) can also be found with a ‘TPL’ marking under the flap, indicating that it has been treated with an anti-fungal process for Tropical use. Did you enjoy this article. You can ‘rate’ it by clicking on the stars below. You can also leave comments – see bottom of this page. I have been a Browning collector for many years and focus mainly on Inglis pistols and accessories. My intention is to assemble an Inglis Pistol display to be shown at gun shows starting in 2015. I thoroughly enjoyed this article and it helps me in sorting out my Canadian holsters. My favorite acquisitions have been two Lake Superior Regiment Officer bring backs and a 9T Diamond. I’m still looking for web magazine pouches, barrels, slides, cut-aways and factory literature.